Transporting a wheelchair or scooter in the bed of a truck would seem easy enough, but there are some common oversights that we encounter frequently. Loading from the side or over the rear tailgate creates several unique concerns. 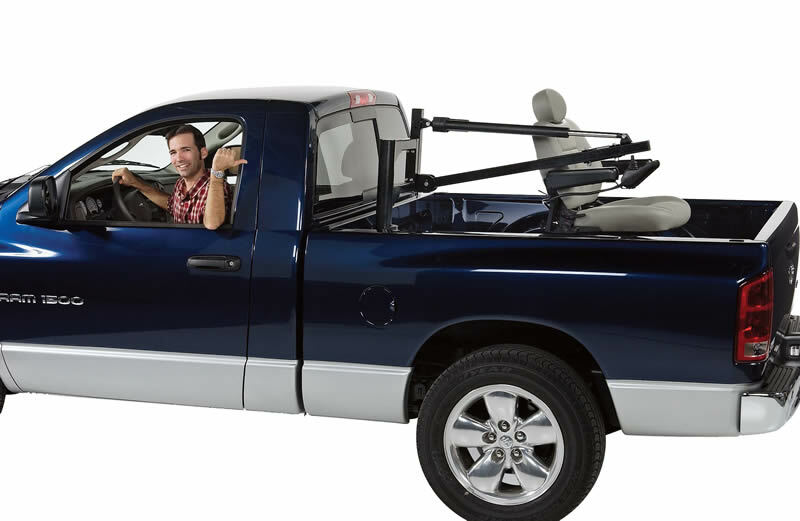 First, if you are considering a truck wheelchair lift, or truck scooter lift, you should decide whether you will ever use a tool box mounted in the bed, a bed cover, or a camper topper. Each of these situations necessitates a different type of lifting process. An example of a side load scooter lift is the Harmar Side Loading Pickup Truck Lift. This lift mounts immediately behind the cab, swings out over the side of the truck, and hoists the lift up. It then swings over the rail and in to the bed of the truck. When considering this option it is important to note that you will not be able to use it easily in parking lots where other parked vehicles are on nearby. You may also choose to use a boom type lift mounted in the rear of the bed which also swings out over the rear wheel well, picks up the wheelchair or scooter, and swings it in to the rear of the bed with the tailgate down. A manually or electric rotating arm lift is required due to the extended limits of the rotation. If the lift will remain in the bed of the truck it should be weatherproof or an easy take down model. When purchasing a wheelchair lift or scooter lift for your truck you should consider how it will be secured once loaded. One last consideration is the height of the bed from the pavement. The mobility device will be much higher in the air during loading than a typical vehicle lift, and may need to be steadied in a high wind.